FBI has unveiled a mobile application that features information on bank robberies across the U.S. and helps connect users to the bureau if they have information on the robberies or suspects. The Bank Robbers app is available for free download from Apple’s App Store or Google Play, FBI said Friday. “[We] focus our investigative resources on those suspects who pose the greatest safety threats to the public… and our new Bank Robbers mobile app is another tool we can use to help mitigate those threats,” said Gregory Adams, chief of FBI’s violent crimes unit in Washington. FBI added the app sorts robberies according to date, category, place of occurrence and the FBI field office in charge of the case and provides surveillance photos, robbery details as well as physical descriptions and wanted posters for each suspect. 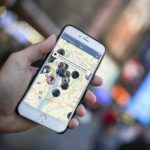 The app also features a notification system that alerts users on nearby bank robberies and a direct link to the FBI online tips page so that users with information on robberies or suspects can contact the bureau. The Bank Robbers app follows the 2012 launch of FBI’s Bank Robbers website that features a gallery of unknown bank robbery suspects.